How secure is your business? Have you had a break in recently? Many commercial businesses wait to handle their building security until after theft or negligence occurs. Don’t wait to call your commercial Locksmith in Hamilton to take care of your security needs. Firstline Locksmith has been serving Hamilton and the greater New Jersey area for more than 25 years. We’ve been helping businesses secure their building and safes with our extensive commercial locksmith services. Instead of searching “locksmith near me,” call Firstline Locksmith, a locksmith company with nearly three decades of experience you can trust. Firstline Locksmith has worked with companies like Wal-Mart, Citibank, Rite Aid, and more. Our 25 years of service spans across various commercial business industries. 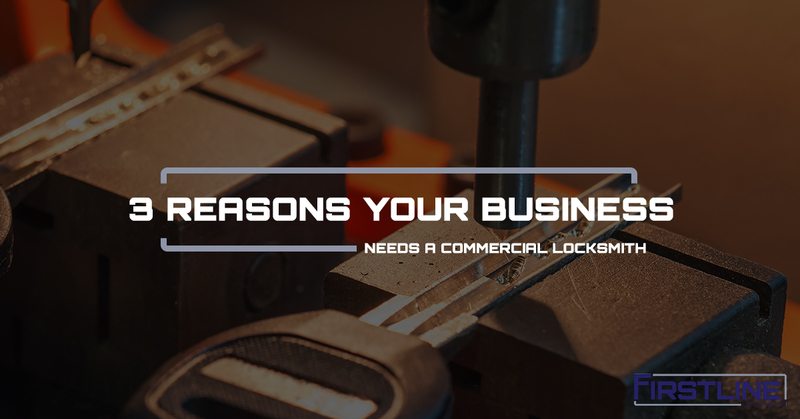 We’ve decided to share the three top commercial locksmith services every business needs to address to ensure the security of their assets and their employees. We understand if you can’t get back into your building. Whether you lost your keys or forgot to grab your key before you left the building, we can help. Our expert commercial locksmith technicians can help you get back into your building in as little as a few hours. Also, we offer commercial door locks to keep unwarranted individuals out of your building. The security grade of your door locks do matter when it comes to building security. The cost of the lock isn’t necessarily the determining factor on its effectiveness. The size of your business, the type of door the lock is being installed into, and the type of security risks you may encounter all play a part in choosing the best commercial door locks for your business. Keep track of who enters and exits your building with a simple entry system setup. This could mean a single checkpoint at the front entrance with trained security guards, or it could mean supplying all employees with keycard-access to the building, managing attributed access levels per person. There are various options you can go with, but it’s best to choose the one which best fits your company. When’s the last time you had someone check your building for security effectiveness and threats? It may seem over-the-top, but the security of your building means the safety of your employees and your business assets. Don’t take security lightly. As a company, it’s tough enough to stay in business. You don’t want to add a potential break in, theft, or negligence to the list of stressors. A security audit will help determine the strong and weak points in your building’s and employee’s security. We understand if your building security isn’t a priority. You have more important endeavors to focus on like profits, closing deals, and customer satisfaction. That’s why we encourage you to give Firstline Locksmith a call. We assist commercial businesses with all their business locksmith needs. We’re a regional company that’s been serving our commercial clients for more than 25 years.